Born on 2 February 1911 Durham, New Hampshire, and a member of the United States Naval Academy Class of 1934, Richard O’Kane served in two of the most successful submarines of World War II. O’Kane began the war as Diving Officer in the elderly U.S.S. Argonaut(SM-1), which was on patrol off Midway at the time of the Japanese attack on Pearl Harbor. A somewhat trying time was had by all, with constant problems with condensation and resulting electrical shorts and grounds and not a few fires. Argonaut was overdue for a Navy Yard overhaul, and upon her return to Pearl Harbor she was scheduled to return to Mare Island. Her XO was sent to a staff job at Pearl, and since O’Kane had recently qualified for command and been promoted to Lieutenant, he moved up to that position for the voyage back to Mare Island. At Mare Island, O’Kane was sent to the under-construction U.S.S.Wahoo (SS-238) as Executive Officer, initially serving under Marvin Kennedy, who commanded Wahoo during her first two war patrols. Starting with her third patrol, Dudley W. “Mush” Morton, who had been aboard Wahoo on a PCO (Prospective Commanding Officer) cruise during her second patrol, assumed command. O’Kane continued as XO. As Morton’s executive officer in Wahoo, O’Kane worked the periscope while Morton ran the attack. The highly successful team was broken up when Wahoo returned to Mare Island for refit in 1943 and O’Kane was detached for new construction. 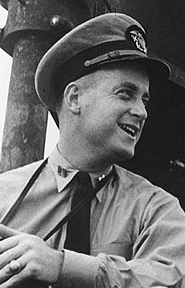 Taking command of the new Balao Class boat Tang, O’Kane returned to Pearl Harbor, departing on his first war patrol in Tang on 22 January 1944. His first attack on a small convoy was delayed whileTang was forced deep to avoid one of the escorts. After evading a depth charge attack, O’Kane returned to periscope depth, firing three torpedoes at Gyoten Maru, the first of 24 enemy ships O’Kane would sink. Five days later, O’Kane made a night surface attack on another convoy, sending two more freighters to the bottom. Over the next three days Tang sank two more ships, bringing her total bag for her first war patrol to five ships for a total of 21,400 tons (JANAC credit, the original wartime estimate was 42,000 tons). Having fired all of his torpedoes, O’Kane returned to Pearl Harbor. Returning to sea after rearming, Tang took up a lifeguard position off Truk, where she rescued 22 downed American airmen. On her third and fourth patrols, Tang sank another twelve ships, adding another 50,600 tons to her tally. At the end of September 1944, Tang set off on her fifth war patrol. She sank two freighters on 10 October. Two weeks later O’Kane found a ten-ship convoy. Going in on the surface again, O’Kane slipped past the escorts, quickly sinking three freighters. A troop transport attempted to ram, but O’Kane evaded, remaining on the surface where he could use his speed to slip away from the escorts before submerging. Another convoy was found the next night, and O’Kane again took Tang in on the surface. This time the escorts were more alert, but O’Kane stayed up, firing six torpedoes at three different ships. All six hit, taking out two transports and a tanker. After firing three more torpedoes, hitting the tanker, and transport, and sinking an attacking destroyer, O’Kane withdrew to reload his tubes with his last two torpedoes. Returning to finish off the transport, O’Kane fired both torpedoes. The first ran true, but the second made a circular run, hitting Tang aft and sinking her. O’Kane and the eight men on the bridge went into the water. One other officer made it out of the conning tower before the boat went under. Only O’Kane and three others were still alive by morning. Five other men managed to get to the surface alive after Tang went to the bottom. The nine survivors were picked up by the Japanese and imprisoned until the end of the war. O’Kane received the Medal of Honor for his actions. He retired in 1957 as a rear admiral, and passed away in Petaluma, California on 16 February 1994. He is buried in Arlington National Cemetery.